Besides announcing that Pokémon GO is now available in 31 new countries, Niantic also teased the next feature coming to Pokémon GO. In an update stated to be coming soon, Pokémon GO medals will finally get a purpose. I always thought that they were neat but pointless since some of them take so much effort to obtain yet don't even reward you with the slightest bit of XP. 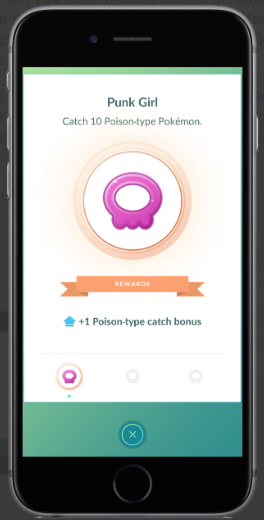 Now, having earned medals like Psychic, Gardner, and Kindler will grant players a bonus that will result in a better chance of a Pokémon of the type associated to that medal staying inside a Pokéball when being captured. Tier 1: capture 10 Pokémon of the medal-specific type for a +1 capture bonus. Tier 2: capture 50 Pokémon of the medal-specific type for a +2 capture bonus. Tier 3: capture 200 Pokémon of the medal-specific type for a +3 capture bonus. How much these bonuses contribute to improving capture rates is unclear since the game doesn't actually tell us what the base capture rate for any given Pokémon is. What we do know, however, is that for multi-type Pokémon the capture rate bonus will be calculated as the average of the bonus earned from each specific type. It seems doubtful that this feature will bring back many of the trainers that have gone astray during the past couple of months but maybe now the remaining Pokémon GO players will be able to catch a Pidgey without losing their minds over wasting countless Pokéballs before it decides that it'd rather just flee. I still think that fixing the Pokéradar would be a better use of Niantic's time to keep players somewhat engaged, but then again, it's not like they're hurting with earnings of approximately $2 million dollars a day.